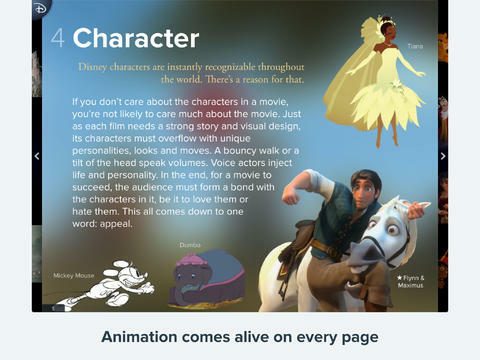 Developer Quote: "In Disney Animated, explore pages packed with interactive images and multi-layer animated clips. 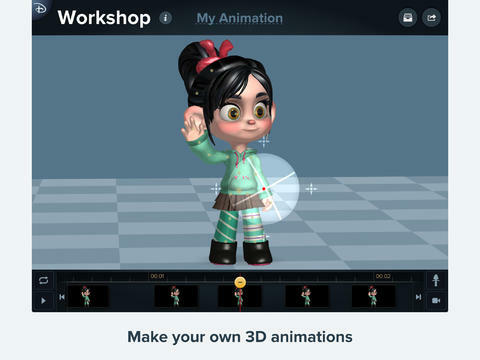 Animate authentic Disney 3D character models, and control a Disney visual effects simulation." Beautiful and creative magic exists in all things Disney. In fact, Disney characters, backgrounds and animation have been enjoyed by all ages for decades. The classics have been passed down from grandparent, to parent to child. Artists and Disney fans alike will now delight in the new Disney Animated iPad app. In this richly illustrated and detailed app, you will uncover the secrets of Disney animation. Enjoy the time period of all 53 Disney animated films. • Read about Disney animation in a way you never could before, and work with Disney characters and technologies via sophisticated interactives. • Reveal work-in-progress animation steps and visual effects layers beneath animated scenes. • Zoom in on concept art, painted backgrounds, and storyboards to see intricate details as never before possible. • Rotate treasured artifacts from the locked vaults of The Walt Disney Animation Research Library as if they were in the palm of your hand. • Animate Vanellope from Wreck-It Ralph using a simple but powerful 3D animation package adapted from real Disney modeling software. Share your animations by email or social media. • Control Elsa’s magical snow from the upcoming film Frozen, using an authentic re-creation of the visual effects animation system used in the movie. Share your snow flurries by email or social media. • Swipe through a complete timeline of every Walt Disney Animation Studios feature film, with animated clips from your favorite characters and recently uncovered trailers. • Trace your finger over the Color Map: a single full-screen image that shows every scene from every Walt Disney Animation Studios animated feature film in thumbnail form. Never before has this complete catalog been browsable in this way. Disney always produces a full and compelling product, so you will find bonus content included in this app such as an unabridged version of the Principles of Animation chapter from the iconic work The Illusion of Life: Disney Animation by Frank Thomas and Ollie Johnston. COOL CONCLUSION: Disney aficionados will be impressed by the wealth of beautiful animation, art and concept work included in Disney Animated. --Developer: Disney; Touch Press software and interfaces © 2013 Touch Press.